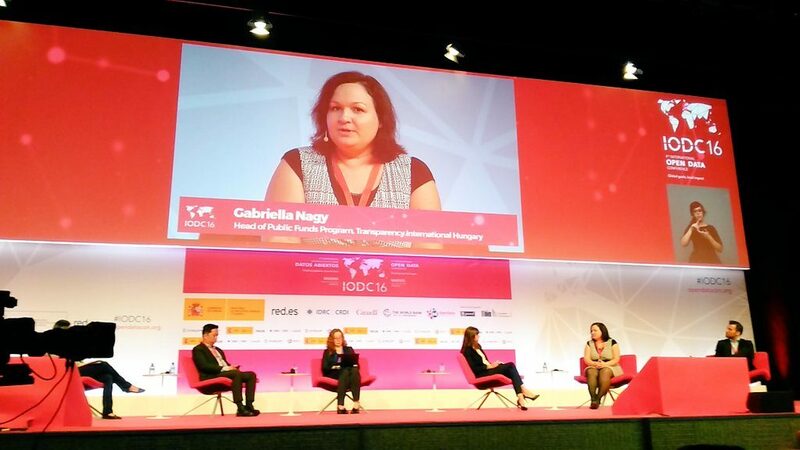 We’ve spent last week at the International Open Data Conference or IODC16 in Madrid, exploring how best we can use open data and technology to combat corruption. Transparency International EU sat down with Gabriella Nagy, the leading expert on corruption in public funds at Transparency International Hungary about their experience with fighting corruption in public procurement in Hungary. Transparency International EU: Hi Gabi, thanks for talking with us. What’s the situation with corruption in public procurement in Hungary? Gabriella Nagy: Corruption in public procurement in Hungary is a huge problem, according to several different studies around 70% of public procurement procedures might be infected by corruption. Of course you hear stories of huge soccer stadiums and random railways in the international press. But beyond the famous and over the top cases is of course the day to day corruption. Our redflags.eu database, which highlights potential corruption risks in public contracts, shows that around 60% of procedures contains one or more red flags. And these are only the high value contracts above EU thresholds. We suspect that procurements below these thresholds are more prone to corruption. TI EU: So with such high corruption risks, what is the public perception of corruption in Hungary? GN: Now that it’s very much open to the public to see, and almost every day there’s a corruption in public procurement scandal in the media, it’s a very hot topic. Transparency International Hungary conducted research with young people which shows that above 80% of young people are aware of the problem. This has been reflected in a general survey of the wider population Too. Most young people condemn the problem and know it’s a bad thing, but we can see that among the general population that apathy is growing. The more people hear about these scandals the more apathetic they are. However, there’s signs of hope among the youth. A few years ago only 25% of young people said they would report cases of corruption if they came across them, and now this year it’s above 70%. TI EU: So how do you tackle this apathy? GN: We want to change this apathy. Raising public awareness is just the first stage. Now the struggle is to show that we can reduce corruption. That can change people’s perception. Our tool redflags.eu is somewhere where journalists, civil society and citizens can go to easily check on cases of corruption, which helps to uncover corruption in public procurement. But it’s one side of the coin. The other side is preventative and coordinated measures bringing together local authorities, companies and civil society to make sure we have clean contracts. Transparency International has a tool, called Integrity Pacts. The tool is essentially an agreement between a contracting authority and bidders for a tender to not engage in any bribery, collusion or fraud throughout the duration of a project. From bidding to competition. The whole process is then monitored by a civil society organisation such as ourselves. We can see all the financial and tendering documents as well as being present during meetings. TI Hungary has already conducted five Integrity Pacts over the last five years. Now we’re about to start two more as part of a wider EU wide project across 11 countries and 17 projects funded by the European Commission. For our previous Integrity Pacts we held a nationwide roadshow, travelling to cities around the country to present the tool to contracting authorities and companies. The Integrity Pacts included public procurement for the National Bank of Hungary, two were with local districts in Budapest, one in the countryside. 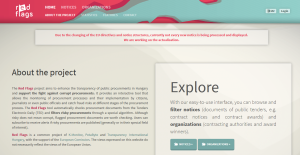 TI EU: And so what did these Integrity Pacts do to reduce corruption in public procurement? GN: Well, after the Integrity Pacts were finished and the projects were completed we then had suggestions on how to change public procurement policies and rules with the knowledge we had gained. But it’s not just the knowledge we gained, the Integrity Pacts had very real impacts: costs across the five projects were lowered by 36%. There was also positivity around the process itself. Companies has far more trust in the procedure we saw far more tender applicants than normal because of increased trust. Usually more than half of public procurement procedures in Hungary have only one bidder. Which shows there’s no real competition. Many companies won’t even start to prepare bids, its expensive gathering together all the required paperwork and putting in the staff time. Many companies don’t have trust in the public procurement process so they don’t even try to apply. Integrity Pacts can increase trust for companies who are tempted to bid on a tender. TI EU: so how do the two sides of the coin link up to reduce corruption? GN: An Integrity Pact is about monitoring one public procurement project. With that we can say that one contract, one project was clean. But when you add in redflags.eu we can start to build a profile of a company around what kind of red flags they get and then point out these issues to the company, so it can have a preventative effect against corruption. By combining Integrity Pacts and redflags.eu we can move from one monitoring one public procurement project to evaluating public procurement practices. We can also map the sector itself – in motorway construction for example we can see the market players and how they operate, what kind of corruption risks exist in that sector, and give this additional info to the contracting authority. It’s not only that we’ll be monitoring one project or procedure, but it can have far reaching effects on reducing corruption for an entire sector.